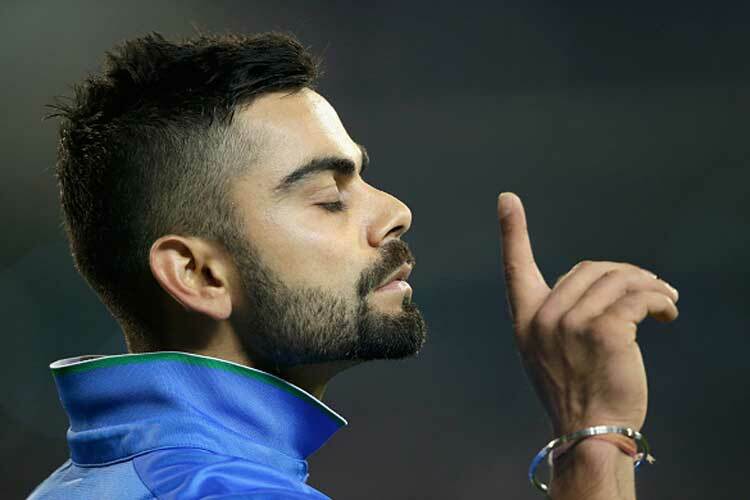 DieHard Cricket Fans: Virat - The new God of Cricket ! He taps the ball to short mid-wicket and sprints like a hare. He carves it wide of sweeper, races two and turns for a third while his partner will be panting to finish the second run. As the shock wave of the ball scorching the stitches on the webbing of his hand, he allows the nerves to absorb it without flinching. When long time aggressor Gautam gets unruly, he grins to himself and leaves Gambhir even more frustrated. When Morris tries to play mind game on Rahul, he doesn't ask him to cower but express positively and what we get is a six over fine leg by Rahul. When Gayle, AB or Rahul is on song, he doesn't dance but plays the second fiddle to perfection. He doesn't compete with team mates playing well, he tries to complete them. He scores eighty and admits in post match conference that he took 10 balls too many. When boys his age are chasing girls and targets, he's chasing monuments. If you're playing against him and win the toss, don't bat first. You've lost it there, unless you pile up runs that a single human being can't chase. Batting first, he piles runs and then hopelessly watches his bowlers leak runs like the municipality taps without anyone to bother. He comes back in the next match and scores even more. Winning is what matters to him as he seldom shows as much passion on personal achievement as he shows when he knows the team is winning. Given a choice between scoring a hundred and losing a match against scoring 99 and winning, he would choose 99, every single time. Very few have been where he is yet he admires Gayle and ABDV and backs Rahul to the hilt. We have seen great players, match winners, record makers, record breakers, legends, absolutely selfless team players, God of the off side, the God and pretty much everything on the Cricket field. We have seen the Dravid tenacity. We've seen Tendulkar straight drive. We've seen the Sehwag upper cut. We've seen the Ganguly cover drive. We've loved the Laxman pull shot. We thought we have seen all that we could have hoped to see. We've seen the steel in the nerves of Dravid at Adelaide. We've survived the Tendulkar desert storm. We were mesmerised by the Multan mastery of Sehwag. We still can't get over hangover of the Kolkata magic of Laxman. We believed nothing could get better than all these. We thought we will be doomed to live and die reliving these legends. We were sure, the God had retired and Cricket ceased to be a religion. And then ‪‎Virat Kohli‬ happened !